For most homeowners, the garage door is a major focal point of the front of your home. Garage doors commonly account for up to 30 percent of the front exterior of a home, so it is important that the door both fits in with the rest of your home and makes a statement. A plain, damaged, or old garage door can lower your property value and stick out like a sore thumb. Fortunately, there are many different garage door customization ideas that can help boost your property value and improve the overall facade of your home. With so many different garage door options to choose from, finding the right fit for your home can be challenging. You want a door that compliments the preexisting aesthetic of your home, but also has that “wow” factor. 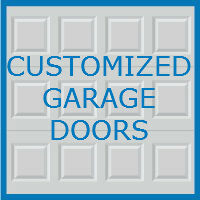 If you are in need of a door replacement, consult a garage specialist. They can help you pick from the variety of different doors, including stainless steel, carriage, wood, copper, and traditional steel doors. Choose something that matches your home’s style but adds some flare to your home. For example, a stainless steel door may be appealing, but it might not fit with a Victorian home. Be sure your door compliments your home. A plain garage door may do nothing for your home, but adding windows can help liven things up. Garage door windows come in a variety of different styles to fit your needs, and can be a nice feature to add to your space. A garage door wrap can be an affordable and effective choice for customizing your garage. Most pre-existing doors in good condition are capable of being customized with a vinyl door wrap. Wraps come in a variety of different colors and styles, and are customizable. If you operate your business out of your garage, consider a wrap that features your company’s logo. Other homeowners have chosen wraps that mimic a wood garage door, and even up close the wrap is nearly undetectable. Stone accents can really make your garage pop. Consider installing stone around the base of your garage, or perhaps columns or pillars. Stone is striking, and typically looks great next to any type of garage door. A garage door surround, which frames your garage door, can add an excellent touch to the exterior of your home. You can customize exactly how your surround will look, choosing a surround that either complements or contrasts with your door. Surrounds can be built from a variety different materials depending on your needs, and homeowners can personalize the colors and finishes. Another affordable option for garage customization is installing accessories. Accessories could include different handles and hinges for your door, or studs outlining your garage door. These options are easy to install and can add some flare to your garage. No matter what your next garage project consists of, the specialized team at Blue Sky Builders is here to help. Our wide array of services includes custom garages, remodels, new door installation, hardware replacement, and more. An old, outdated, or broken garage door is doing no favors for your home. Call 630-852-8485 today or visit Blue Sky Builders online to learn more about how we can help you get the garage of your dreams.